Our third annual Holiday Duck special is now available. 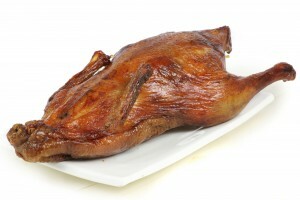 This year you can order online under the Holiday Duck Category and we are delivering as well. Of course, you can call in and order over the phone or in person as well! One whole duck, roasted, not carved. Duck will need to be reheated in oven. One pack of pancakes, ten pieces. Wrap in wet towels and microwave or steam to soften them up. Eight ounces of our plum sauce. One bag of sliced onion. You must order 24 hours in advance, we will turn off ordering for that day 24 hours in advance. You must prepay with credit card. If you don’t we will ask for payment when we call you to confirm. Please fill in an appropriate name and phone number. We will call you about your order for pickup / delivery time. Holiday Duck 2012 Coming Soon! We are working out the details of our 3rd annual Holiday Duck sale. We should be sending out an announcement this week! We will list our specials here in the future!